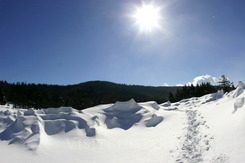 The resort site of Semkovo is 17 kilometers away from the huddled at the foot of Rila town of Belitsa. The site is situated among spruce and pine- tree forests. It provides a exclusive panoramic view towards a chain of high alpine peaks on the spruce and fur- tree forests. A unique panoramic picture towareds the chain of high Alpine peaks on the watershed of central Rila can be viewed from here. The site offers excellent opportunities for winter sports and summer mountain tourism. It is situated on 1750 meters above the sea level over the southern slope of Rila and the awesome Pirin. The site can be reached through a picturesque mountain road. The relief is mainly mountainous and hilly and the climate is Mediterranean with a huge mountain influence. The snow cover is formed at the beginning of November and in January it becomes 60- 80 centimetres. The natural gifts together with the already existing pistes and ski- equipment machinery characterize Semkovo as a resort for mass ski- tourism and year round site for holiday and relax. Semkovo provides seven ski pistes with a total length of 4 kilometres operated by eight drag lifts. Three of them are on the northern slopes and are quite difficult. The ski drill grounds in the resort are relatively short and small slope and are great for a mass sport. Semkovo offers seven ski runs with a total length of 4 km, including three ski runs on the Norhten slopes, with all ranges of difficulty. The ski runs are services by eight drag lifts. The slopes are perfectly maintained! • The ski piste in the Semkovo site is 400 meters long and is serviced by a drag with a capacity of 150 people per hour. • The ski piste in the Orlite site (Kartal) is 800 meters long and is serviced by two ski drags. The first one is 800 meters and the second one is 1100 meters with a respective capacity of 450 and 700 people per hour. An exclusive tourism attraction during the winter are the sleights covered with colourful rugs and take the guests of the nearby situated town of Belica to the different tourist objects in the Semkovo resort. Semkovo is a great starting position for many picturesque sites following the touristic marks. Extremely interesting site for a visit nearby Semkovo is the newly opened Park of the dancing bear.